If you’ve been looking for ways to improve your daily eating habits and have more fruits and vegetables on a regular basis, you might have found it challenging. 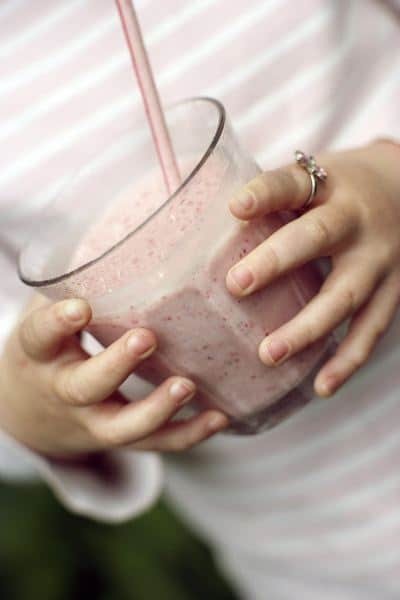 Fortunately, a quick and easy way to incorporate more natural foods into your diet is to make smoothies. However, most blenders are built for large servings, meaning that you will have a lot left over that could spoil and need to be tossed out. Wouldn’t it be great if there was a better way to make a healthy smoothie without having to create a full batch? The simple answer is to get a single serve blender. 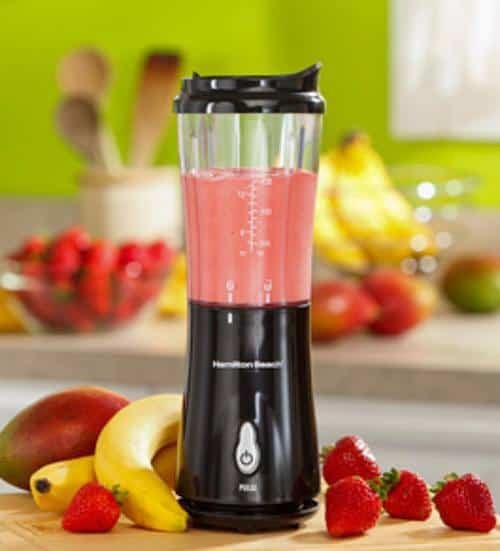 These handy appliances enable you to make fresh and delicious smoothies on the go. Because they are made for individual servings, you get just what you need for your personal dose of vitamins and nutrients. Today let’s see what these blenders have to offer you, how they can benefit your busy lifestyle and which are the most recommended models, according to user reviews and our own experience. 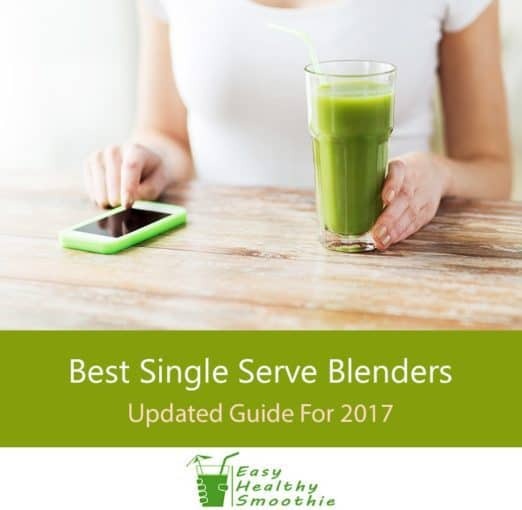 What is a Single Serve Blender? Unlike traditional blenders, these devices are built with one serving in mind. To make that possible, you place a smaller cup over the blades to make your smoothie. That way, instead of having to pour your mixture from the blender into a cup, you can take care of everything all at the same time, making it much more efficient. Single serve blenders come in various sizes, from fourteen to thirty-two ounces, depending on your needs. That way, you can make as little or as much as you want without creating any waste. So why bother with this kind of blender when you can get a full-size model? 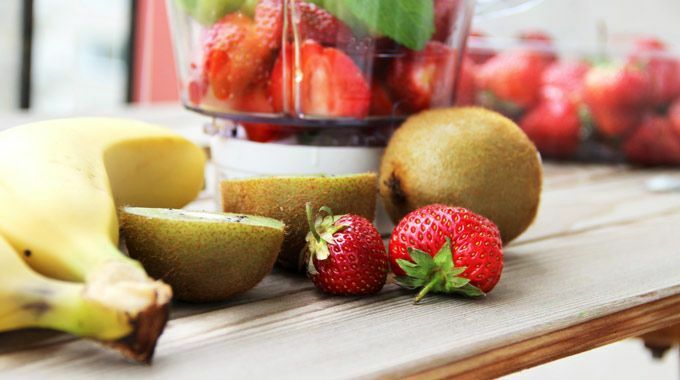 Simply put, a single serve blender will make your life much easier and enable you to get healthier without putting a ton of effort into changing your habits. ​Efficient Operation: Since the cup is also the blending jar, you can use the same container for everything. Easier Cleanup: Instead of dirtying a large pitcher and a travel mug, you are creating fewer dishes to wash. Plus, most of these cups are dishwasher safe. Fast Blending: A big reason why people don’t make smoothies too often is that it takes too much time. With these blenders, you can toss ingredients and get a full mixture in less than a minute. Meals on the go have never been easier. Healthier Lifestyle: Because it’s so easy to make a healthy blend of fruits and veggies you are more likely to make these drinks on a regular basis. Doing so will ensure that you improve your diet, which can lead to weight loss and better overall health. The model that started it all is the NutriBullet. Before 2006, single serve blenders were not very common, but this machine changed everything. So, that means that everything else is a copycat of this highly capable device. 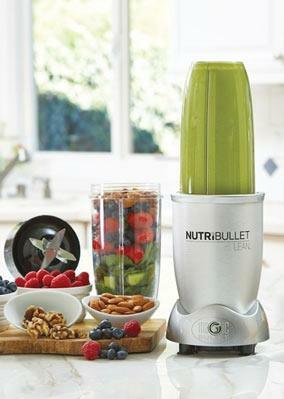 What makes the NutriBullet so efficient is the motor and the simplistic operation. 900-watts of power mean that you can make a smoothie in about twenty seconds, regardless of how many ingredients you include. The other secret to the success of this model is that the blades are specially designed to process food so much faster by creating a vortex action and slicing them better than most other blenders. As a result, you can extract more nutrients in less time. Finally, the fact that you get two cups, lids, handles, and a recipe book means that you can get more out of this device than you can with other similar models. The Cuisinart brand is synonymous with high quality food processors, so it makes sense that it will venture into single serve blenders as well. Personal blenders can be highly convenient but usually limited in scope, meaning that if you want to prepare other kinds of food, you have to compromise or buy another machine. 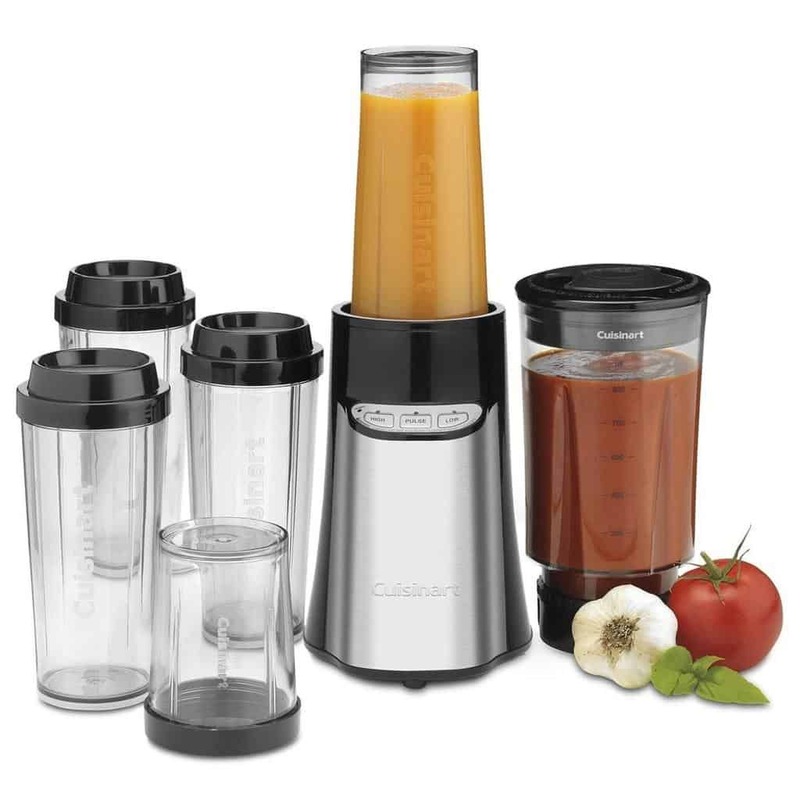 However the Cuisinart SmartPower CPB-300 is more versatile than other personal blenders. First of all, you get six different cups. One is designed for quick chopping, another is designed to make large batches, and the rest are all single serving cups. That means that you can make as much or as little as you want, and if you’re lazy like us, you can go four days without having to wash your travel cup - but when finished drinking, do give the cup a 3-seconds wash so you’d have an easier time cleaning them later. In addition to the convenience of having different sized cups, you get a safety locking mechanism and auto shutoff if the seal isn’t secure. Three control settings keep you in control of the blending experience. 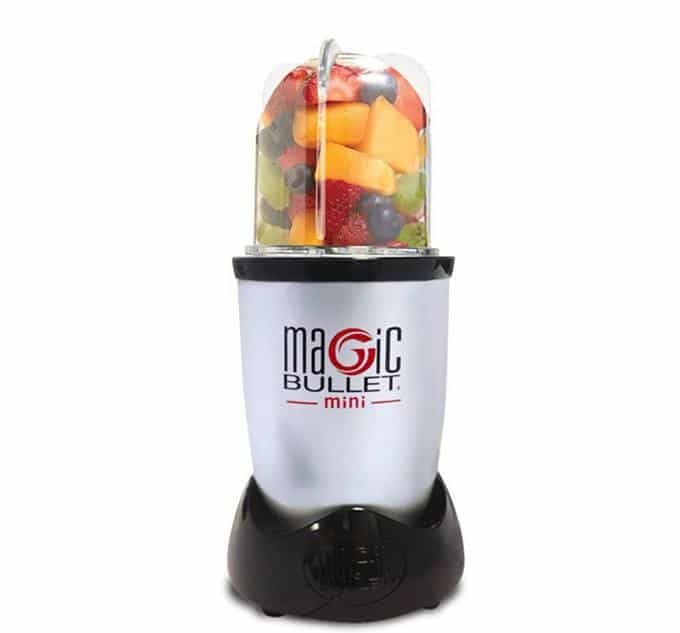 If you want all of the benefits of the NutriBullet but don’t want to make such big servings, then the Magic Bullet Mini might be your best option. You will notice that the company is the same, meaning that you will get the same known quality that you will with a standard NutriBullet. 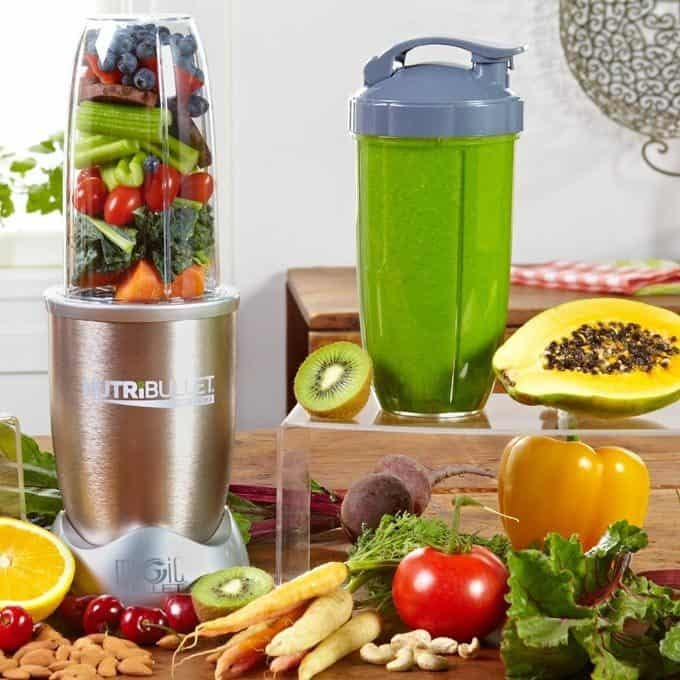 What makes this model ideal for some people is that it is much more compact and it comes with a twelve-ounce cup, making it ideal for personal smoothies without the need to mix big batches. This is contrary to some other single serving blenders which can actually be rather big. As far as performance goes, you can blend your ingredients in just ten seconds, making this one of the fastest and most efficient blenders on the market. You can be ready to go and out the door within two minutes, making breakfast and snack time much more convenient. Bear in mind the jar is not dishwasher safe, so if that’s important to you, the Ninja Fit (below) might be a better choice. That’s the reason for knocking off a point in our rating. Otherwise, we do think it’s a great choice. If you’re familiar with the Ninja brand, then you know that this company makes some of the best kitchen equipment around. What makes the Ninja Fit interesting is that it comes with a powerful 700-watt motor, yet compact in size. That means that you can process all of your ingredients in seconds, so you’re ready to go as soon as possible. Remarkably, the machine works just as fast even if you use frozen ingredients, so you have many more options than with other similar models. The Ninja Fit comes with two 16-ounce cups with lids. The travel lids screw on with ease and allow you to enjoy your drink all day long. Finally, cleaning the Ninja Fit is easier as all components are dishwasher safe, including the extractor blades. 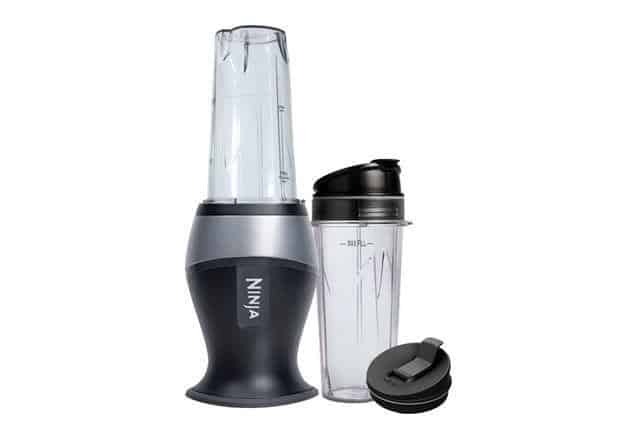 The slightly bigger brother of the Ninja Fit, the Ninja Pro is one of the most popular and quality blenders around. While both devices are powerful and highly economical, this model has extra power and extra features that make it more versatile. So, if you’re looking for something that can make all kinds of foods (not just smoothies), then this might be for you. First of all, you can tell that the Nutri Ninja Pro is powerful because it comes with a 900-watt motor. That means that you can process your smoothies within ten or twenty seconds, regardless if your ingredients are frozen or thawed. The other thing that makes this model more ideal is that it has two different sized travel cups. One of them is eighteen ounces, and the other is twenty-four, so you can make as much as you want. To help you get started, this machine also comes with the excellent Ninja Recipe Book that gives you all kinds of suggestions of how to make your life healthier. You can read our full Ninja Pro review here. If you want a bit of style to go with your blender, then the Oster Blend-N-Go MyBlend may be a good choice. While Oster is another well-known appliance brand, what sets this blender apart is the fact that you can choose one of six different colors for your device. That means you can add some personality to your kitchen while staying healthy. 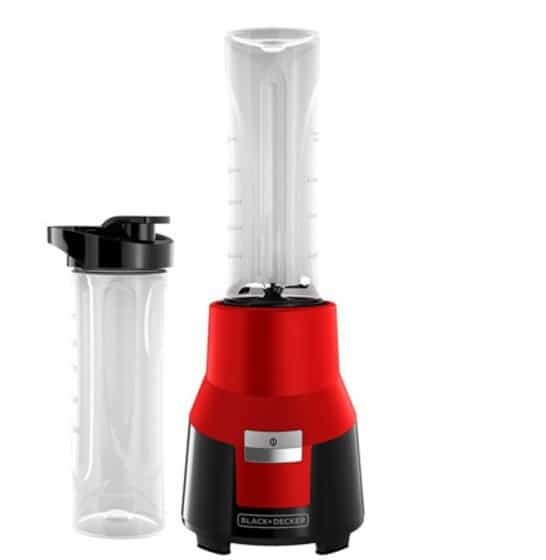 The My Blend is very affordable, but his comes with the price of being less powerful than most other blenders in the list, having a motor of just 250-watts. This might present a challenge when trying to crush tougher ingredients such as apples, carrots and beet. It come with the extensive Oster Recipe book to help you get started. Finally, this model comes with a three-year satisfaction guarantee, which is more than most other brands will offer. While this next blender doesn’t have quite the same level of torque or power that we’ve seen with other models, what sets it apart from the pack is the design of the blades. 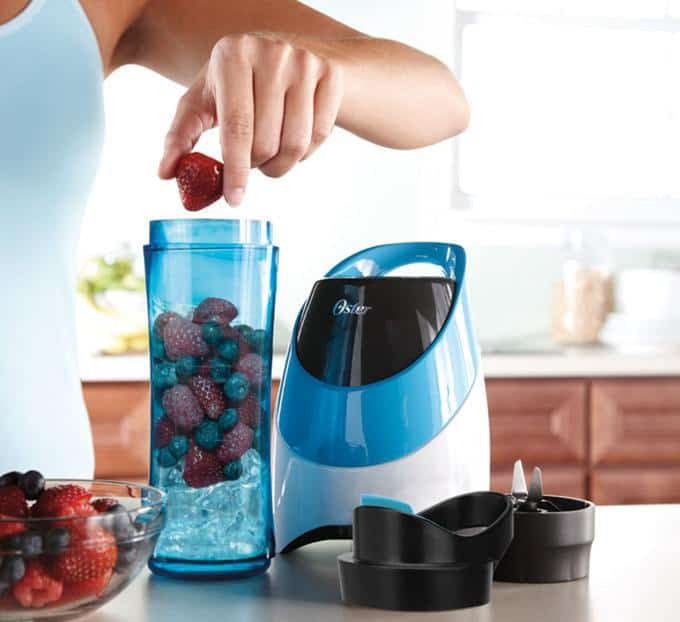 Black + Decker has developed a FusionBlade system which means that you don’t need as much power to make a smoothie in seconds. Like the My Blend above, what also sets the FusionBlade Blender apart is the fact that you can choose from four dynamic colors. So, if style is something that is important to you, this machine can help you add some personality to your blending. As far as convenience, the FusionBlade comes with two 20-ounce cups with travel lids. That means you can make two batches for you and a friend, or you can wait another day before cleaning everything. Also, with one-button operation, you can be on your way in less than five minutes. Finally, this blender comes with a two-year limited warranty, which makes it reliable as well as versatile. Next, we have a personal blender from Epica. While this brand is not as well known as Cuisinart or Ninja, this machine is more than capable and can definitely help you with healthier eating habits. 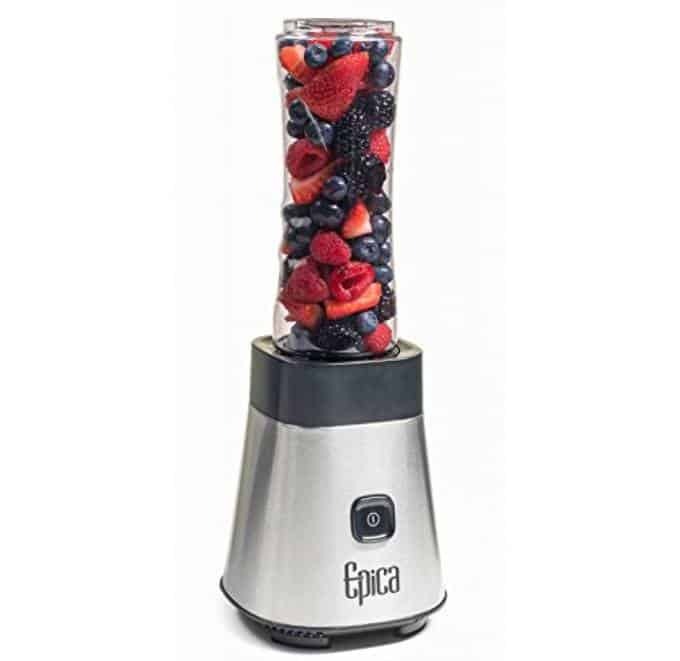 When talking about performance, the Epica Blender comes with a 250-watt high-speed motor. 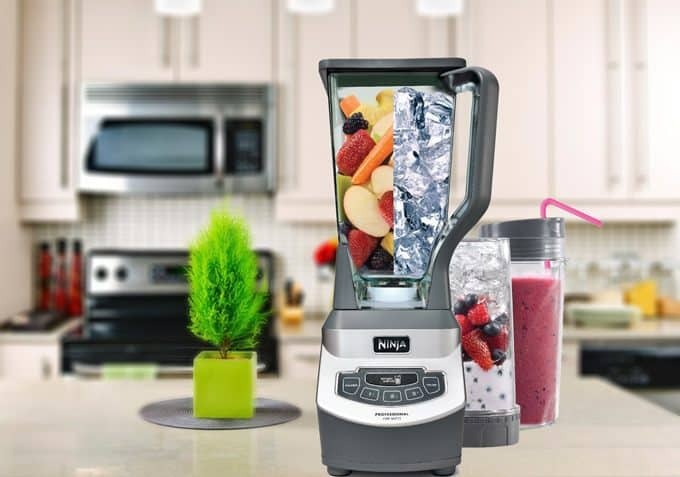 One-button operation and a pulse feature mean that you can create delicious smoothies in seconds, regardless of if the ingredients are frozen or thawed. The entire machine is compact and lightweight, which means that it takes up less space on your countertop and can store easily. Jar is dishwasher safe. Epica offers a two-year limited warranty for this device. This blender comes with one twenty-ounce mug, which is BPA-free and dishwasher safe. You also get a screw-on travel lid for your convenience. The Hamilton Beach is designed for people who want to incorporate more smoothies in their life without splurging on an expensive, high-end device. While this blender is more than capable, it doesn’t have as much power as other models that we’ve seen, making it ideal for the casual smoothie maker. The motor on this unit operates at 175-watts and usually creates smoothies in less than a minute. The mug included is fourteen ounces, and the whole blender is small and compact. Storage is a breeze with this unit because of its size and the fact that you can wrap the power cord around the base. Finally, cleaning this blender is easy because all components are dishwasher safe and BPA-free. To close this list, here’s a cool device which isn’t exactly a blender since it won’t effectively handle most fruits and veggies, however it is great for mixing protein shakes with superfoods and soft ingredients such as peanut butter, maca, ground flax, etc. 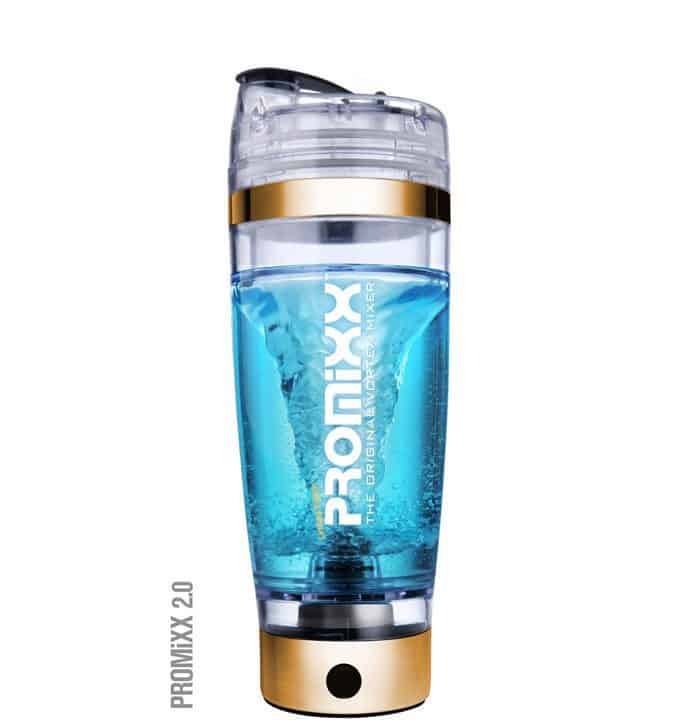 The PROMiXX 2.0 comes with a compact motor that allows you to use it anywhere, using its USB rechargeable battery. Cleaning is a breeze as the whole thing can be cleaned at once. Also, the seal is designed to be leak-proof, so you never have to worry about your shake getting all over the counter or spill in the bag, even while you’re blending. When trying to decide on the best blender for you, make sure that you keep in mind how much you will be using it as well as what types of things you will be making. For more in-depth guidance on how to choose a blender, see our blender buying guide. If you are only interested in smoothies, then we would suggest the NutriBullet or Ninja Fit. However, if you want a model that can do more than make single servings, the Cuisinart model or the Nutri Ninja are your best bets. Have any questions about 1-serve blenders? Found your perfect personal one? Share in the comments below - Happy blending! Find your perfect personal blender to enjoy healthy delicious smoothies - we review and rate the 10 best single serve blenders for 2018! I’m looking for a blender and this type seems perfect for me! I was originally planning to get a different type but it makes much more sense for me personally to have a single serve version. Thanks so much for this post, it really helps me to weigh up my options! Glad we could help, Anna! I’ve been thinking about buying a single serve blender so this piece has come at just the right time for me and it’s given me lots to think about. Thanks! Our pleasure, Carly! Love to hear what you decide to go with in the end. A single serve blender sounds like a great for me to get my fruit and vegetables and only have to make one serving. I’ve seen so many awesome looking recipes that are for two people (or more sometimes) and it’s frustrating when I’m the only person who has smoothies in the house so it’s great to know I can just make a serving for myself and not have to worry about waste! Thanks for your comment, Laura! It can be really frustrating when you just need one serving so this type of blender can be great for you. Let us know which one you can go for in the end and how you get on with it! Wow great, This review article gives me a better knowledge to find out the qualityful blender. Which is the best manufacturer for personal blenders? Blendtec or vitamix? I’m stuck on which to buy. Hi Steve, they’re both superior quality, both in build and results. It’s up to personal taste – Vitamix looks and feels more “traditional”, Blendtec (my favorite) is more high-tec. Let me know what did you choose and how was it to try it for the first time. My first experience with both of these brands was pretty mind-blowing. I wasn’t used to such a quality of smoothies.